I have both the misprint & regular Serra Angel and the misprint & regular Aladdin's Ring. I also have the misprint El-Hajjaj/Warp Artifact and want to find the regular card to go with it. Does anyone know if the misprint El-Hajjaj is from German white border revised (German Unlimited Edition) or if it's from German 4th Edition? Once I figure out which set it's from, will I be looking for a regular El-Hajjaj, or a regular Warp Artifact? Last edited by cataclysm80 on Sun Oct 27, 2013 10:51 pm, edited 1 time in total. cataclysm80 wrote: I have both the misprint & regular Serra Angel and the misprint & regular Aladdin's Ring. I also have the misprint El-Hajjaj/Warp Artifact and want to find the regular card to go with it. Does anyone know if the misprint El-Hajjaj is from German white border revised (German Unlimited Edition) or if it's from German 4th Edition? Once I figure out which set it's from, will I be looking for a regular El-Hajjaj, or a regular Warp Artifact? Many thanks for activating my account Dragsamou! It's great to be here. I believe the Forest/Plains, Sedge Troll/Manabarbs, and Drudge Skeletons/Swamp misprints are all German Revised. A German fellow on the Facebook misprints and rarities page told me that he thinks the El-Hajjaj/Warp Artifact is actually from German 4th. It does seem to have round dots above the lowercase j's as 4th should, but I don't have any other German lowercase j's to compare to, only German lowercase i's. If I had the not misprinted German El-Hajjaj in front of me, I'm pretty sure I could tell which is which, but at this time I only have the misprint version. 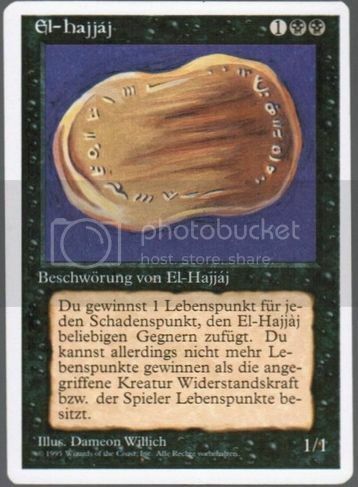 Two people on magiccardmarket.eu (German website) insist that they have regular printings of German White Border Revised El-Hajjaj, but that doesn't necesarily mean that the misprint is 4th Edition, It could mean that the misprint was supposed to be a Warp Artifact. However, two different people on magiccardmarket.eu also insist that they have regular printings of German White Border Revised Warp Artifact. If regular German White Border Revised printings exist of both El-Hajjaj & Warp Artifact, then the misprint would probably be from German 4th. Unless the card was printed on the sheet multiple times and only some of those were misprints, in that situation, all three could be from the same set. I didn't see anyone on magiccardmarket.eu that insisted they had a 4th edition version of either El-Hajjaj or Warp Artifact. Then again, I don't know these people on magiccardmarket.eu, so I'm not really sure that information can be used as a trusted source. I'd buy some of these cards and compare for myself, but that website does not allow people outside of Europe to join. I have a higher opinion of Librarities members. Does anyone have the misprint and regular that they can compare side by side? Confirmation of the existence of regular printings of either card from either set would also be a small step in the right direction. cataclysm80 wrote: Many thanks for activating my account Dragsamou! It's great to be here. But as I'm not a Misprint Specialist, even if I have a nice collection of the Regular and Special Misprints, someone here will give you the appropriate answer. Another card in German Revised is a Regular Misprint, the Tundra, no Artist Credit for All of them. But as I'm not a Misprint Specialist, even if I have a nice collection of the Regular and Special Misprints, someone here will give you the appropriate answer. 2. Take a look at the lower-case letters "i", "j" in the card title. If their dot looks like a slash, the card is from 3rd Edition, if their dot is round, the card is from 4th Edition. Ornithopter from german 4th Edition is misspelled "Ornitropher"
If you want a full list of such misprint stuff not listed at SQUT's Page, PM me. The Swamp/Skeleton card is named Heer der geplagten Skelette, which does not contain any lowercase i's or j's. The lowercase g's & p on the Swamp/Skeleton are definately down into the art box border though, which according to rule 5 would make it 3rd Edition. On 3rd Edition cards, the "g", "p", and "q" touch the upper art box border, while on 4th Edition cards, the "g", "p", and "q" float above the upper art box border." It's difficult to see the art box border on the black cards, but because the misprint is on a swamp, that one is more visible. On the Italian White Border Revised second printing with the Bold Copyright, Channel uses the i with a dot, while Library of Leng uses the i with a slash. very curious. Last edited by cataclysm80 on Tue Oct 01, 2013 3:18 pm, edited 1 time in total. When I wanted to look yesterday at that regular Misprint in my binder, I realized that I don't own it , looks like this case is a huge headache, cause All Warp Artifact/El-hajjaj old threads or even on google are listing this card as Revised not 4Th Edition, so should this Misprint exist in both Editions? Regarding the Full list of Misprint not listed on Squt's page, you can post here, in the "Missing Info", I'm sure, that will help some Misprints Collectors. I suppose it's possible that it could be misprinted in both sets, that hadn't occured to me. Seems unlikely. I know that regular German White Border versions exist of both El-Hajjaj & Warp Artifact, but not sure whether they are 3rd or 4th Edition. cataclysm80 wrote: I suppose it's possible that it could be misprinted in both sets, that hadn't occured to me. Seems unlikely. But would love to have a clear as crystal answer about it. But you missed rule #1 which is even more important. "have your coffee BEFORE you make posts....... LOL. Correct. I have one now, and I'm on the case, as it seems that's real not an easy German story. Warp Artifact/El-hajjaj his Misprint is from 4Th Edition German and that an El-hajjaj No Misprint from 4Th Edition exists. Swamp/Skeleton his Misprint is from 4Th Edition German. Does a Warp Artifact/El-hajjaj Misprint exists from Revised German (Unlimitierte Auflage) ? Does a Normal Warp Artifact exists from Revised German (Unlimitierte Auflage) ? Does a Normal Warp Artifact exists from 4Th Edition German ? Does a Swamp/Skeleton Misprint exists from 4Th Edition German ? Does a Normal Drudge Skeleton exists from 4Th Edition German. The Mana Barbs/Sedge Troll is from Revised Edition German, or from 4th Edition German, or both ? As Sedge Troll doesn't exist in 4th Edition. Does a Mana Barbs/Sedge Troll Misprint exists from 4Th Edition German ? Does a Normal Sedge Troll exists from Revised German (Unlimitierte Auflage) ? Drudge Skeleton: see German 4th edition. 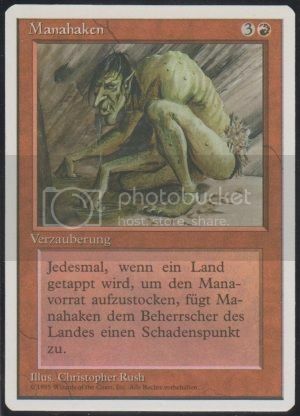 Manabarbs: In German unlimited only, has the picture for a Sedge Troll. Forest (4E-german): One Forest card has the picture for a Plains. 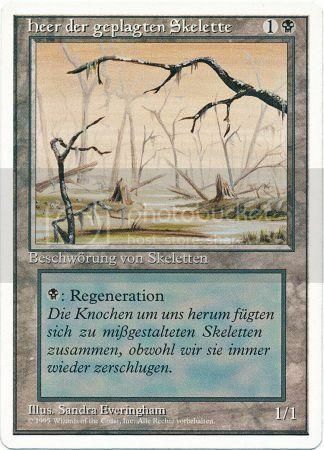 Drudge Skeletons: The early printings of German 4E Drudge Skeletons have the borders and art for a swamp. This error may also exist in the German Revised, perhaps unlimited german revised only? Last edited by dragsamou on Tue Oct 08, 2013 10:26 am, edited 11 times in total. mmgun wrote: Another curiosity regarding the lowercase i's... I've noticed that on the BLACK BORDER Revised cards, most card names use the i with the slash, but for some reason Twiddle in German & Italian (I don't have a French Black Border Twiddle yet) uses the i with the round dot. I find it odd that we have two different lowercase i's in the black bordered set, and wonder if the same thing could happen in the white bordered sets. It's enough to make me question the accuracy of rule # 2, although it certainly seems to apply most of the time. Twiddle doesn't exist in Revised, do you mean from Renaissance? I am 101% sure that the Swamp / Drudge Skeleton misprint was (also) in "German Unlimited" (i.e. WB revised or the edition with Dual lands, just to make myself clear) since I recall pulling some out myself from booster packs at the time. Maybe they exist in 4th too, I don't know. And as Alexis pointed out, BB Twiddle is not a card in Italian or German "BB first editions", but comes from Renaissance.